ai5000's Joe Flood digs into the causes of the May 6th Flash Crash — when nearly 1000 points mysteriously disappeared from the market in a matter of minutes — and unearths internal analysis leaked from a Bank That Shall Not Be Named, surprising new data from the market research firm Nanex, and a first-time admission from the NYSE: that there were significant price reporting delays on May 6th, delays which contributed to the Crash. It’s been nearly four months, but experts still aren’t sure exactly what caused May 6th’s “Flash Crash,” when nearly 1000 points mysteriously disappeared from the Dow. The SEC’s ongoing investigation should cast more light on the issue, but don’t expect a definitive diagnosis. It’s been almost 25 years since Black Monday, and while a mixture of market psychology, Black-Scholes-induced portfolio insurance and—like the Flash Crash—stub quotes, hide-and-seek market makers and foolish stop-loss market orders (doesn’t anyone learn their lesson?) have generally been blamed, there’s still quite a bit of debate in academic circles over the exact causes. But fear not, fair readers, as some inside analysis leaked to ai5000 from a Bank That Shall Not Be Named, and a first-time admission of price reporting delays from the NYSE provides new insight into the Crash, and what could be done to prevent another one. The first detail to jump out from the report is that, like the wispy dust devils that sometimes presage a tornado, trading anomalies in shares of Apple (AAPL), appeared more than 5 minutes before anything else strange occurred, a virtual eon’s worth of time in a High Frequency world. From there, the chaos moved to the S&P as a whole and particularly to Exchange Traded Funds (ETFs), which accounted for more than two-thirds of the trades eventually canceled. ETFs bore the brunt because unlike similar index funds, ETFs can be traded on a day-to-day basis (making them vulnerable to market swings) but unlike normal stocks they can’t be traded and re-priced very easily. That means that when spreads open up between the price of ETFs themselves and the underlying stocks that constitute them, the only way to shrink those spreads is through a series of semi-complicated futures trades. On normal days that process is fairly routine, but as liquidity dried up, the ETF market went haywire. There has been a lot of chicken vs. egg bickering on the cause of the Flash Crash and ETFs: was the problem with the ETFs themselves? Were the underlying stocks the root of the crash, kickstarting an ugly chain of events that was multiplied by the roundabout process of pricing ETFs? The fact that Apple was the first stock to trade strangely lends some credence to a theory promulgated by financial blogger David Waggoner that Apple may have been at the root of the crash (As Waggoner notes, Apple’s the largest constituent stock of the first ETF to crash). But as fun as it is to ask questions like “Did the iTunes Genius algorithm cause the Flash Crash?” the new analysis also reveals a much bigger problem: price reporting delays on not only Alternative Trading Systems (ATSs) like BATS and Arca, but even the NYSE and Nasdaq. One of the more well-publicized weaknesses that the Flash Crash exposed is the inability of different exchanges too coordinate “circuit breakers,” designed to rein in extreme volatility. The problem was so bad on May 6th that NYSE programs designed to slow down trading in run-away stocks actually made the situation worse. But the analysis shows that not only were there problems with coordinating responses, there were mechanical delays in the reporting and printing of the prices that stocks traded at, with delays lasting as long as five minutes on some alternative exchanges. Here things get interesting, but fairly complicated, so bear with me. The delays appeared on the Consolidated Quotation System (CQS), which logs all the bids and offers on public exchanges. As part of the National Best Bid Offer (NBBO) system, the SEC requires brokers to act on the highest available bids and lowest offers, to get the best prices for their clients. When price reports are delayed, as happened during the Flash Crash, this becomes extremely difficult, because the best prices are often outdated prices that can’t actually be acted upon. After 15 or 20 minutes the alternative exchanges caught up, but, according to the leaked analysis, the NYSE’s printed prices continued to lag behind. According to the market research firm Nanex, these delays were as long as 24 seconds, enough time to wreak havoc with the NBBO and make it extremely difficult for brokers to make trades—further drying up liquidity and worsening the market collapse. For the first time in public, yesterday the NYSE confirmed to ai5000 what the leaked research and Nanex reports indicate: that there were significant reporting delays from the world’s largest stock exchange. “Because of the incredibly high volume that day, there were brief delays in the reporting of a subset of stock quotes,” said NYSE spokesman Ray Pellecchia. “We were in the process of upgrading our programs, and some areas that hadn’t yet been upgraded,” were unable to handle the increased load. Got all that? Because the complications keep coming. 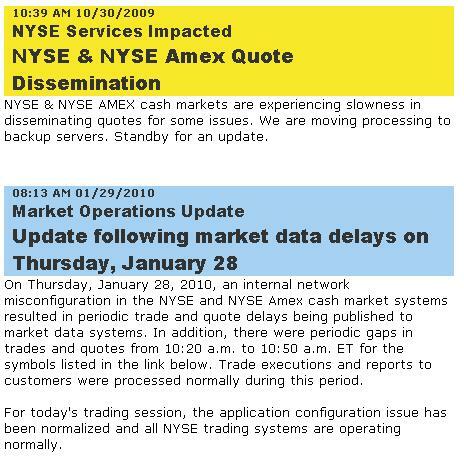 In Nanex’s formulation, the lag occurred because the NYSE bids and offers weren’t being time stamped when they were first made, but after they got in line behind other qoutes and were processed by the bogged-down NYSE servers. By the time that process was finished and the time stamps finally applied, the actual prices had already moved on. It wouldn’t be the first time this has happened, but May 6th was no ordinary trading day, and along with the Apple and ETF pricing problems and reporting lags on other exchanges, the delays further tightened an already downward spiral. The NYSE maintains that the delays did not actually impact trading during the Crash. “We believe these delays were the result of, and in no way a contributor to, the issues on May 6,” says Pellechia. In instances where bids appeared to be higher and offers appeared to be lower on the NYSE than on other exchanges, brokers were legally required to go after those quotes, and lots of business would have been routed away from other exchanges and on to the NYSE. The problem was that those lower offers and higher bids on the NYSE didn’t actually exist anymore—they existed 24 seconds ago (cue: Back to the Future theme song). So instead of making actual trades based on current prices on other exchanges, brokers would have been chasing phantom trades on the NYSE—resulting in less liquidity on other exchanges, and for the NYSE, an even bigger backlog of trades that couldn’t even be executed. It’s possible that some traders spotted the discrepancy and knew the prices were outdated. For thousands of dollars a month, some trading firms get access to direct quote services like the NYSE’s OpenBook, which actually gave up-to-date time stamps, unlike the more broadly used CQS. But not even the NYSE realized that their prices were delayed until they started combing through the data in the aftermath of the Crash. It’s hard to see how many traders could have spotted it in real time. Either way, the inconsistencies certainly served as one more reason for high frequency market makers to pull back from the market entirely—which many did—out of fear that the strange trades would eventually be canceled. Because high frequency funds hold positions for extremely short durations, by the time a trade is canceled the firm has already sold the shares. On May 6th, a firm could have bought, say, a share of Accenture for as low as a penny, then sold it off for $20 as Accenture climbed back to it’s normal price around $40 a share. But when trades were canceled, the net result was that the firm had inadvertently shorted the stock at the $20 a share they sold it at—turning a $20/share profit into a $20/share loss. That’s a pretty steep penalty for staying in the market and providing liquidity, and plenty of reason for firms to get out of the market entirely the next time there’s extreme volatility. With so many firms pulling the plug out of fear that trades would be canceled, liquidity dried up even faster. As for designated market makers, who are required to always have bids and offers on the table, they put out “stub quotes”—bids so preposterously low and offers so high that they don’t expect anyone to take them up on it—as a way of technically staying in the market, but bowing out of it for all intents and purposes. But with liquidity completely dried up, when some poorly thought out market orders—which buy or sell at any price so long as it’s the best one out there—hit the exchanges, the stub quotes were put into play. Hence, you had Accenture selling for a penny a share, and the aforementioned Apple selling at $100,000 in some cases. Still with me? This brings up the question of what caused the delays in the first place. Could some high frequency firm(s) have intentionally clogged the trading pipelines to create the reporting delays and taken advantage of them? Could the delays have occurred naturally, but some firms piled on to increase them? Both scenarios are entirely possible (particularly the latter) but, like the harmonic oscillation of a poorly designed bridge, growing through its own sheer momentum, the negative feedback loops of ETF pricing problems, reporting delays, and evaporating liquidity could have easily spiraled out of control of their own accord. As Napoleon supposedly said, never ascribe to malice what can explained by incompetence—or in this case, incompetence, technical glitches, and bad time-stamping. Joe Flood is the author of the recently published book The Fires, which looks at the evolution of computer modeling, urban planning and urban economics through the lens of New York City’s 1970s fire epidemic and fiscal crisis.